There are flies I got at various places or tied by myself. It is interesting that tenkara fly has local color. The flies of commercial fishermen of Kurobe headstream that is in Northern Japanese Alps of 3,000 meter class in the border of Toyama Pref. and Nagano Pref. Three in the left are flies of Mr. Zenichirou Onikubo who kept fishing iwana (char) by the Kurobe headstream for 40 years. The hook was Kaizu No.14. Bantam of black in early season, brown in best season, black-and-white in autumn were used for the hackle each. The body was tied three times by silk black thread and was tied by peacock herl in summer. Shamisen string was used for the eye. The rod length was 3-3.6m. Horse tail was used for the line. After it had become hard-to-find, the nylon line No.3 (0X) that was shortened 50cm more than the rod was used. The right side is the fly with a tail of Mr. Bunpei Sonehara who is last commercial fisherman in Kurobe. He kept fishing iwana for about 10 years in Kurobe until the fishing area was lost by constructing Kuroyon Dam. The hackle was bantam of red brown. The body was tied 3 times by black thickish silk thread. The eye was not attached. The rod length was 3.9m. The furled tapered line of horse tail that is a little longer than the rod was used. The tippet was No.2 (2X) 30cm. These are flies that I replicated. References: Shimura, S. (Ed.) (1989). IwanaⅡ: Kurobe saigo no Shokuryosha [Last Commercial Fisherman in Kurobe]. Tokyo: Hakujitsusha. Shimura, S. (Ed.) (1990). IwanaⅢ: Zoku Genryu no Shokuryosha [Sequel Commercial Fisherman in Headstream]. Tokyo: Hakujitsusha. Deep in Kurobe that was not able to go since it was managed by Kaga Han (Domain) at the Edo period. Its management (Okuyama mawari yaku) was abolished in Meiji Restoration 1870, so the commercial fisherman Toyama Shinaemon in Taira-mura Shinano (Omachi Nagano) built "Taira no koya (Hut)" and he began iwana fishing and hunting in the next year. Mr. Yasataro Shitaka of Ashikuraji Toyama managed the hut, and performed the commercial fishing from 1917. Mr. Kakuei Saeki of Ashikuraji began to manage the hut in 1948. He tried to learn the secret of iwana fishing from Yasataro, but was able to ask only how to make kebari. Construction of Kurobe Dam was started in 1956, and "Taira no koya" sank in the dam lake. New "Taira no koya" was built in the position high 100 m from the original place in 1963, and after Mr. Satohide Saeki, Mr. Satonori Saeki has inherited the hut now. Traditional kebari of Ashikura Toyama that are used over three generation in Kurobe. These are kebari of Mr. Satonori Saeki that I replicated. The hackle is brown color or black color rooster. The body is tied together by peacock herl and purple silk thread. It seems that it imitated a fly and a beetle. References: Imanishi, Y. (1992). The nature story of Kurobe. Tokyo: Houken Corp. Isojima, I. (2011). Ashikura guide no keifu [Genealogy of Ashikura guide]. Research bulletin. 11, Toyama: Tateyama Caldera Sabo Museum. Koyama, G. (1991). Kurobe no Yasataro. Tokyo: Ateneshobo. The flies of Mr. Makio Okuhara who is a son of commercial fisherman Mr. Yuritaro Okuhara, and fished the stream of Norikura from around 1965 to around 1986, and delivered iwana to Nagawa hot spring Fukinoyu. He opened the fishing-tackle shop at Matsumoto in 1975, and tied the fly that was taught by his father, and was named "Sanpei Kebari" from his shop name, and had sold it. The hook was iseama No.6, the body was tied by cotton thread of black, the hackle was black color of bantam, and about 60cm tippet of No.1 (4X) was attached. I have heard that a fly with an eye was made for Western style fly-fishing since requested. Mr. Mitsuo Nomura who was taught how to tie a fly by Mr. Yuritaro Okuhara and many commercial fishermen played an active part at streams in Norikura. The flies were given me by Mrs. Makio Okuhara. References: Tokado, H. (2013). Shokuryoshiden [Lives of Commercial Fishermen]. Tokyo: Rural Culture Association. I found the "Kebari of Double Hackle" which were taken together with the fishing tackle shop stickers and shops card in the photo that was sent from my fishing friend. Because I was able to understand that the kebari were bought at Matsumoto of Nagano Prefecture by the shop card, I contacted the fishing tackle shop to hear various things. It was revealed that these kebari are the same as the kebari of Shiojiri and Iida of the following, is a pattern that have been used since long ago also around Matsumoto; and these have been used in the wide area such as the main stream and branch of Azusagawa River, Saigawa River and Hakuba area in addition to Kisogawa River and Naraigawa River. (Map of rivers where "Kebari of Double Hackle" have been used.) I heard that Kebari had been tied by the grandfather of fishing tackle shop owner, and the production of Kebari are commissioned to a fly hook workshop of Banshu (Hyogo Prefecture) now. The hook is Sodegata No.10 (Western hook size #10) and the tippet of about No. 2 (2X) has attached 30cm. The body of left fly is tied the copper wire. It has the brown hackle in addition to the black hackle. I got flies that were tied by a local person at the fishing tackle shop in Shiojiri, Nagano. These are traditional flies that have double hackle that are called "Sugippa-maki (Japanese cedar's leaves wrap)", and are used at Kisogawa River upper part, Naraigawa River, etc. In addition to these, I got the pheasant hackle fly of blue-black double hackle and, some flies of single hackle. Moreover, I was able to get a fly of crow-feather that is not an item for sale. The size of a hook is #11 or 12 about in the Western style. The left 2 hooks are used Kuwahara-Tenkara OH Straight No.4. These flies were sold at the fishing tackle shop in Iida of Nagano before. These are the same as above-mentioned Shiojiri kebari and this pattern is reminded of Renegade-fly of Western type. Left 2 flies are stamped in the package with "Yamame,Iwana-bari Ginrin crystal (Tippet name of Toray)". The hook is Sodegata No.9 (Western hook size #11) and the tippet is No.1.5 (3X). Right 2 flies has a label of "Banshu Nakayama Mitsuo Shoten's mark No.10 RAINBOW Yamame Iwana". Morioka Kebari is well known as fly of double hackle, and there was also a thing of same pattern in kebari that I got in Hida Shokawa area but it is rare in other area. It seems that both of flies were tied by the request of Iida's fishing tackle shop at Nakayama Mitsuo Shoten in Banshu. Iida is located in the middle of "Sanshu-kaido (Route 153)" that divided from Shiojiri of Nakasendo and reach Okazaki via Mikawa Asuke. Its route was "Shio no Michi (Salt Road)" of the historical trade route that connects the inland and the Pacific Ocean. The distance of Iida and Shiojiri is about 80km and Kisogawa River and Naraigawa River upper part are not so much distant from Iida, so I think that these flies will have the same origin as fly of Shiojiri. Kaga-kebari fly's origin goes back until Edo period. Kaga is present Ishikawa Prif. At that time, Kaga Domain encouraged the river fishing (sweetfish) as samurai's privilege, and competed for not only the fishing results but also the making and the beauty of their flies. In the Meiji period (1868-1912), anybody was allowed to enjoy fishing, and selling flies became businesses. Kaga's artificial flies for the sweetfish were displayed at National Exhibition in 1890, and they were praised for their beauty by the people all over the nation. The technique of the traditional craft-work of urushi and gold foil is used for small flies. Photo's are the present kebari for Iwana and Yamame that were tied with the traditional craftsmanship by Meboso Hachirobei Co. The upper row is the flies to use underwater, and the lower row is the flies to float on the water surface. References: Digital Archives of Ishikawa Japan. Retrieved January 19, 2008. Kaga Kebari Meboso Hachirobei Company. Retrieved July 26, 2017. These were used at Miyagawa River system of Gifu. The left fly has black hackle and thick body of black wool yarn. The other flies are said "Sakasakebari" in Japanese. There flies are tied in reverse hackle. These have hackle of Japanese hen pheasant's breast feather, body of peacock herl and silk thread. The hook doesn't have a eye so the eye is made by silk yarn of blackish red. These have brown hackle or ginger hackle, body of peacock herl or red silk thread. These all have hackle of pheasant's feather, body of cotton of flowering fern and peacock herl. Traditional kebari that were used at Itoshirogawa River of Kuzuryugawa River upper stream. The left kebari has the body of peacock herl and the hackle of white webb. Especially since webb is limp and tends to contain water, it is a material that is not used for dry fly. I think it is a very rare kebari. 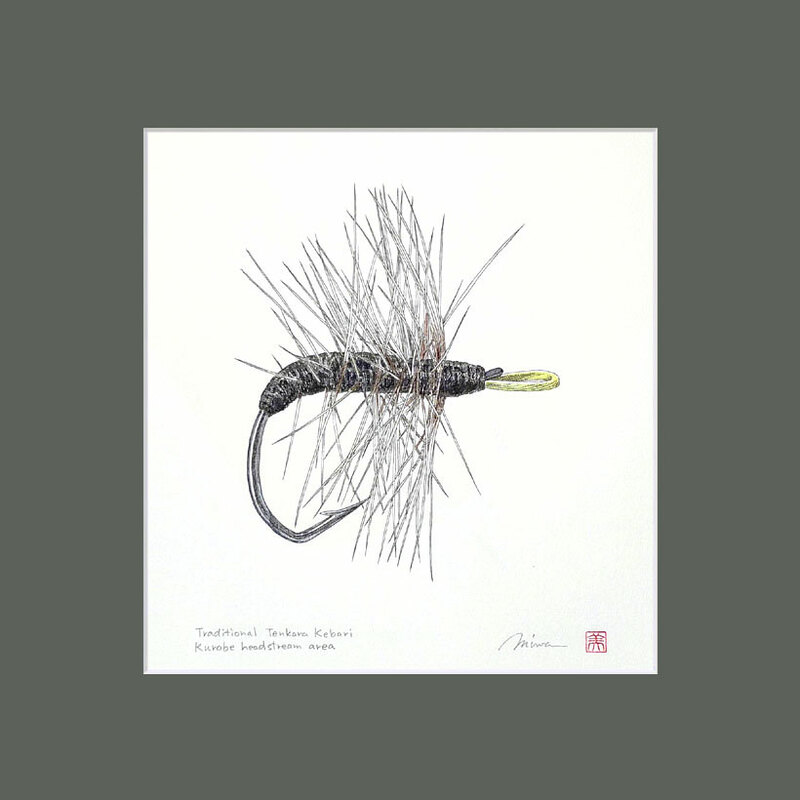 The right kebari is tied to the hook for ayu of Kitsune No.7, and has the eye of a casting net string, the body of the black cotton thread, the hackle of bantam rooster that is tied thickly and turn the reverse side to the eye side. This kebari was used like Western dry fly that floats on the water surface and don't add manipulation. This fishing method was performed by Mr. Tomoyoshi Kubota of commercial fishermen in 1935s. Kebari to sink and Kebari to float, it is the feature that both are large and have a white hackle. These are flies I replicated or reproduced. References: Nirazuka, J. (1998). Nihon-shiki Kebari-tsuri no Sekai [The world of Japanese style Fly fishing]. Fly Fishing Nyumon [Primer of Fly Fishing]. Tokyo: Whole Earth Publications. Suzuno, F. (1993). Yamaryou [Mountain fishing]. Tokyo: Rural Culture Association. These are "Sakasakebari" that has handed down to Mino Gujo area. These are flies that were remade by modern sense. These have neck hackle, body of silk thread. Eye is made by yellow mono-filament. The right fly is traditional fly that has body of cotton of flowering fern that I tied. Kebari of Urakiso Kashimo-mura(village) of Gifu prefecture side in Adera mountains that is known as a place of production of the hinoki(Japanese cypress) from the ancient times. (By the municipal merger in 2005, it is Nakatsugawa city Kashimo now.) The hackle was tied by hen pheasant neck hackle. The body was tied by cotton of flowering fern. Wire of shipping tag that was twisted together to peacock eye was used to ribbing of the body. The style of coiling wire around kebari is the same as kebari of Maenikko Ashio. This kebari was called "Tenkara" or "Kiji-bari" at Kashimo-mura. This is Kebari that I reproduced. References: Suzuno, F. (1993). Yamaryou [Mountain fishing]. Tokyo: Rural Culture Association. The Oku Mikawa Highlands is located in the southwest of the Kiso Mountains (Central Alps), and is next to Nagano Prefecture, and the tenkara fishing of amago is superior. In the area, the method to hook the trout that is called "Karabari (Hanging hook)" has been handed down. They were called "Tenkara" in Kansagawa River and Yahagigawa River basins, and were called "Kabari" in Oonyuugawa River basin. Commercial fisher Eiji Ito of Taguchi Shitara-cho used rod 3.9m, furled tapered line of white horse tail 2m, tippet number 1.5 (3X), and 4.2m in total length. It had a karabari in the tip, and a fly above 10-15cm as a dropper. The hook is Masu No.7. The body use peacock. The hackle is the reversed hackle of hen pheasant. The Karabari is tied only by black cotton thread. In the best season (after May), the method without the karabari was used. Kebari were used in both the tip and the dropper in old days. The left is fly that I reproduced referring to "Mountain fishing". Two of the centers are flies that I tied referring to Asuke kebari of Yahagigawa River of "Tenkara Fishing". The right is kebari that I tied referring to the kebari of bulbul wing hackle of Asuke rod maker Takeo Suzuki of "Tenkara Fishing". References: Suzuno, F. (1993). Yamaryou [Mountain fishing]. Tokyo: Rural Culture Association. Yamamoto, S. (Ed.) (1989). Tenkara Fishing: Kebari-tsuri no Subete [Tenkara Fishing: All of Kebari fishing]. Tokyo: Ikeda Publishing. These are the original pictures of only one by ink and watercolor. 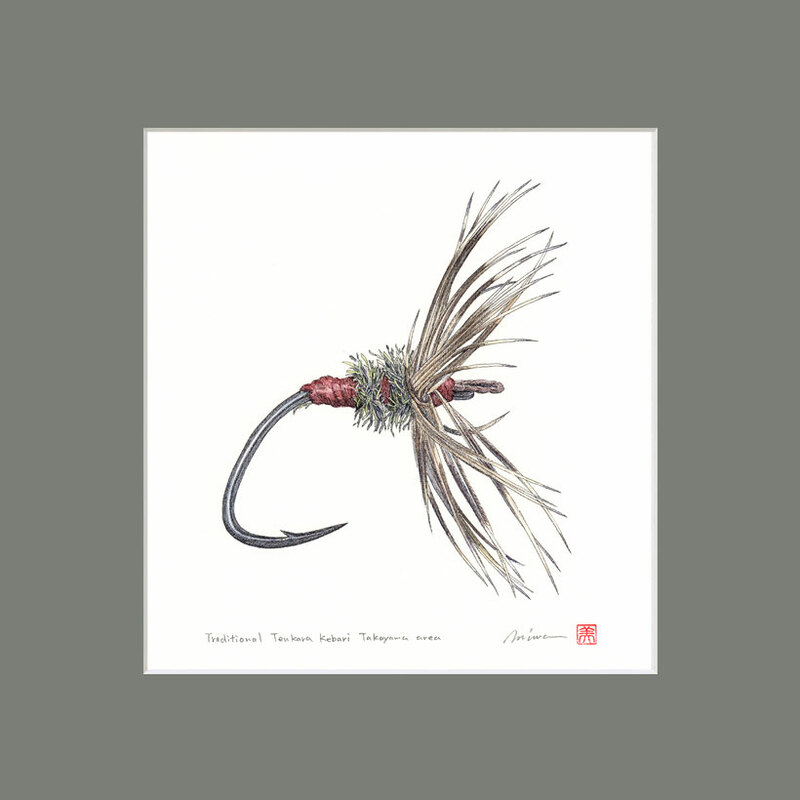 If you are interested in ordering Pictures of Traditional Japanese Fly, please look at STUDIO TROUT & SEASONS. Traditional Fly (Densho Kebari) of various areas in Japan were reproduced under my supervision and were released by TENKARA-YA. If you are interested in Traditional Japanease Fly, please visit to Tenkara Fishing Tackle Shop TENKARA-YA.